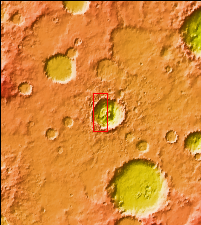 This VIS image shows half of an unnamed crater in Noachis Terra. The complex rim and rough floor are indicative of a relatively young crater. With time and erosion, craters fill in with sediment, creating flatter floors and smoothing the overall topography.